They’re he-ere! The absolutely adorable flip flop soaps are poured and nearly wrapped, all ready to deck your bathroom in coastal Christmas flair. I decided to take you behind the scenes and show you how I make these soaps. They’re a bit of work, but the results are so totally worth it! Check it out! Pouring Flip Flop Soaps from Sara Nesbitt on Vimeo. These charming soaps come in two festive scents: Sleigh Ride, a brisk fragrance that blends mint, vanilla, and pine; and Christmas Spice, a lovely spicy seasonal scent that has been a favorite among my customers for fifteen years. Not only would these look awesome in your bathroom, but they make unique stocking stuffers and thoughtful gifts for the beach lovers in your life. I invite you to pick yours up today. Quantities are very limited, and I don’t think these will be around for long. How was your Valentine’s Day? Ours was pretty nice. We’re not so much into the hearts and roses thing here. For us, it’s a day to celebrate loving each other in our lives, and we’ll use it as an excuse to make a special dinner, but that’s about it. The girls and I made this pretty scrumptious cake for their dad, he made beef stroganoff for us (my favorite), and we popped the cork on a bottle of wine. I received some sweet cards, including a handmade card from my girls, and the perfect card from my husband. The girls and I get to extend the celebration this week while we visit dear friends and my Grandmother. 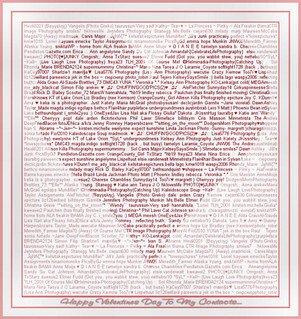 For us, Valentine’s Day isn’t a one-time holiday to share love or to celebrate loving the special people in our lives. Valentine’s Day is just another day for us. We believe in celebrating our relationships with those we love every day. We say “I love you” and “You’re pretty great” on a regular basis. What are your thoughts about Valentine’s Day? Is it something special, or just another “Hallmark holiday”? Warm Up Your Valentine’s Day! We’re sh-sh-sh-shivering our way through the week here in Coastal North Carolina with our area looking like a beautiful Winter Wonderland as ice coats trees and lawns with icicles dangling from our mailbox, flag stand and grill. With all this cold weather and ice, I’m trying to warm up with some warm thoughts. I’m thinking about Summer beach trips or snuggling with my sweetie beside a roaring fire. I’m pondering hot soaks and even hotter massages. Maybe there’s a reason that the most romantic day of the year falls in the dead of winter. We have all sorts of goodies to warm up your Valentine’s Day, whether you’re of a mind to warm that special someone’s heart or warm that special someone’s body. Check out all the totally scrumptious offerings! This soap will put you in the mood for l’amour with its lovely romantic floral scent. A full body massage is the best way to heat up cold nights. There’s nothing like the feel of oil warmed in your lover’s hands before your lover rubs it on your skin! Just for her, roses that will last longer and smell better than the overpriced long-stem variety so popular at Valentine’s Day. Treat her to a soap, lotion and lip balm that will make her body feel special. What special way will you treat your Valentine this year? * Due to inclement weather here, orders won’t go out before Thursday, so I’m afraid I can’t guarantee Valentine’s delivery. Gift certificates, however, can be there within hours. Valentine’s & Anti-Valentine’s Things To Do! Posted on February 11, 2014 Categories Bath and BodyTags chocolate, Friday, Holidays, Home, massage, roses, soaps, Thursday, Valentine, Valentine's Day, Winter WonderlandLeave a comment on Warm Up Your Valentine’s Day!